Steven Williams just got back from Ontario this morning. He’s got a pickup in Coachella, California, and then he’s driving to Yuma, Arizona, for three more pickups. There, a team will pick up that load and take it back east. It will be a long day, but there’s nowhere Steven would rather be than driving for Storey. And he should know. He’s been driving for more than 30 years, 12 of them with Storey. 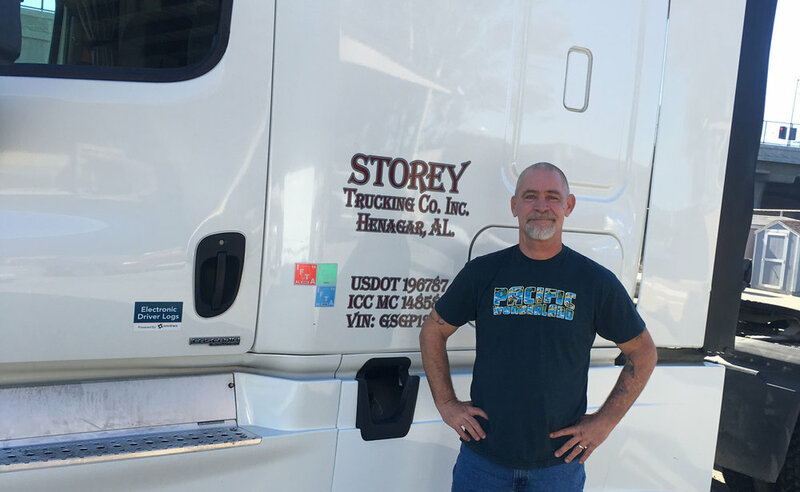 As a local driver, Steven, along with six other drivers between the east and west coasts, perform a pivotal role in Storey’s delivery operation. They allow “over the road,” or OTR drivers for short, to drop and hook at the company’s end destinations in the California area, as well as in the Alabama and Georgia markets. This allows the OTR drivers to quickly drop the trailer they’ve been hauling long-distance, pick up a new one, and get back on the road quickly — a process that plays a significant role in helping OTR drivers meet their mileage quotas. Local drivers like Steven take the trailers that OTR drivers drop off, hitch them onto the backs of their cabs, and haul them to their end destinations, saving time for the OTR drivers who have other obligations. Steven, who lives in California, loves driving for Storey. He takes pride in the fact that he’s worked for Storey for so long, the dispatchers don’t just know him by name — they know him by his voice. With a driving route that encompasses around 500 miles, Steven says that sometimes it can account for long days. But to him, knowing that he’s working for a company that has good benefits and rewards his loyalty and treats him with dignity and respect, it’s well worth it. “They definitely stand behind their drivers,” he says. And Steven knows if he ever has a problem, he can go straight to the president, Eric Storey. What are you waiting for? To learn more about driving with Storey Trucking, visit our drivers page. You can also call Steve or Eric at 800.633.2444 or apply online today.